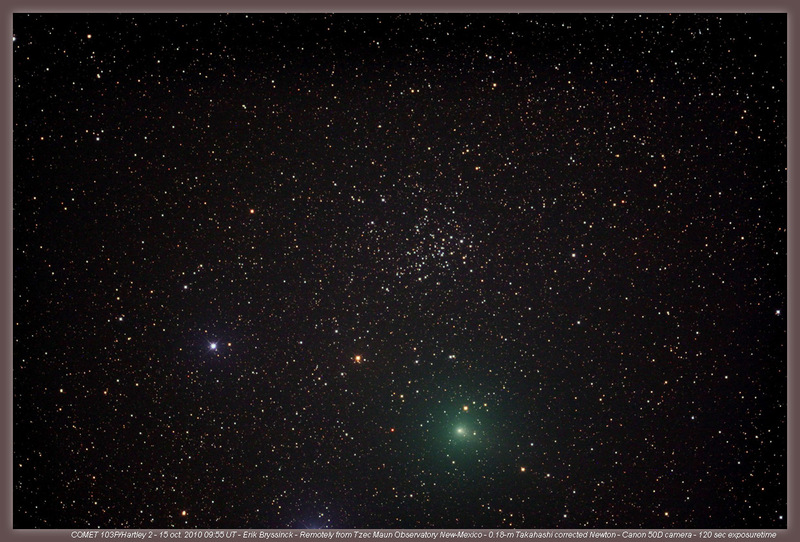 Its brightness is now beginning with a "5", but how well comet 103P/Hartley 2 (more general info here, here, here, here, hier and here) can be seen in the sky is extremely dependent on the brightness of the sky background - because the huge coma is spreading the light widely. Some see nothing at all, others a bit, and still others report naked-eye sightings, all at the same time. A detailled analysis (earlier; more) shows that peak brightness is already near, so an improvement in Hartley's visibility, esp. with the return of the Moon, seems unlikely. 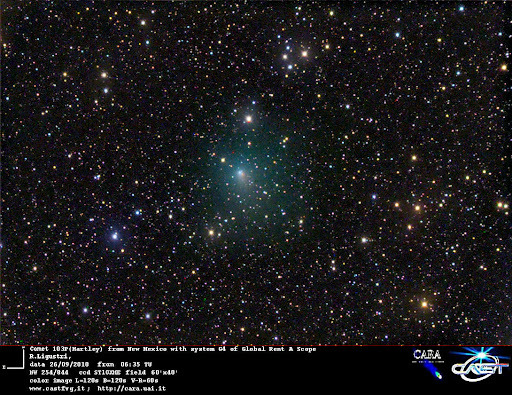 The comet has been a subject of studies e.g. at Lowell Obs., and from space, of course: EPOXI is coming closer (blog; animation), and Hubble as well as WISE have observed it. 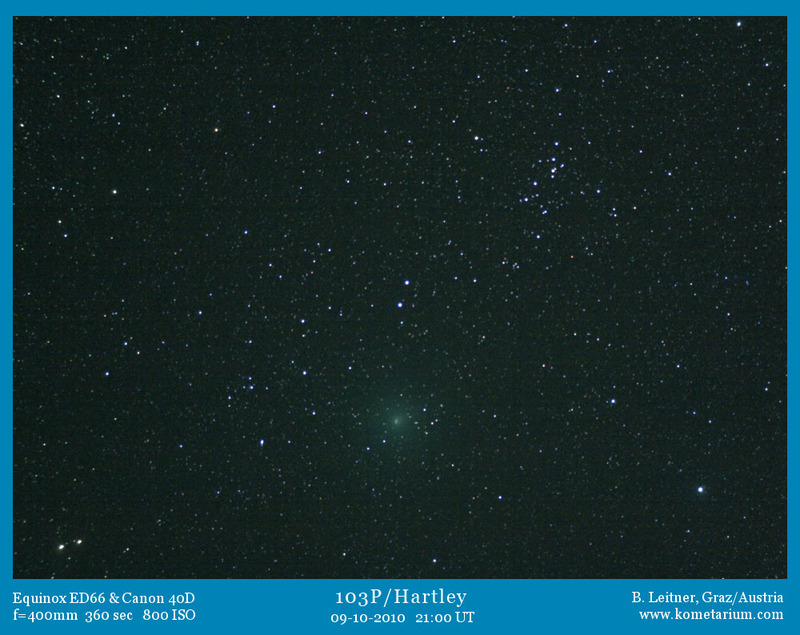 For the experienced amateur photographer Hartley 2 has been a fine show as well: selected pictures of Oct. 13-15 (mosaic), Oct. 15 (other field of view), Oct. 14., Oct. 13, Oct. 12 (more), Oct. 11 (more, more), Oct. 10 (more, more, more, more, more, more), Oct. 9 (more, more, more, wide view [explained hier and hier], more), Oct. 8 (C/A to double cluster; more, more, more, more, more, wide view), Oct. 7 (more, more, more), Oct. 6 (more), Oct. 5 (more), Oct. 4 (more, more), Oct. 3, Oct. 1-2 (collage), Oct. 2 (more, more, more), Oct. 1 (more, more, more, more, more), Sep. 30 (more), Sep. 29 (more, more, animation), Sep. 28, Sep. 26 and Sep. 20 (more), plus more pix. 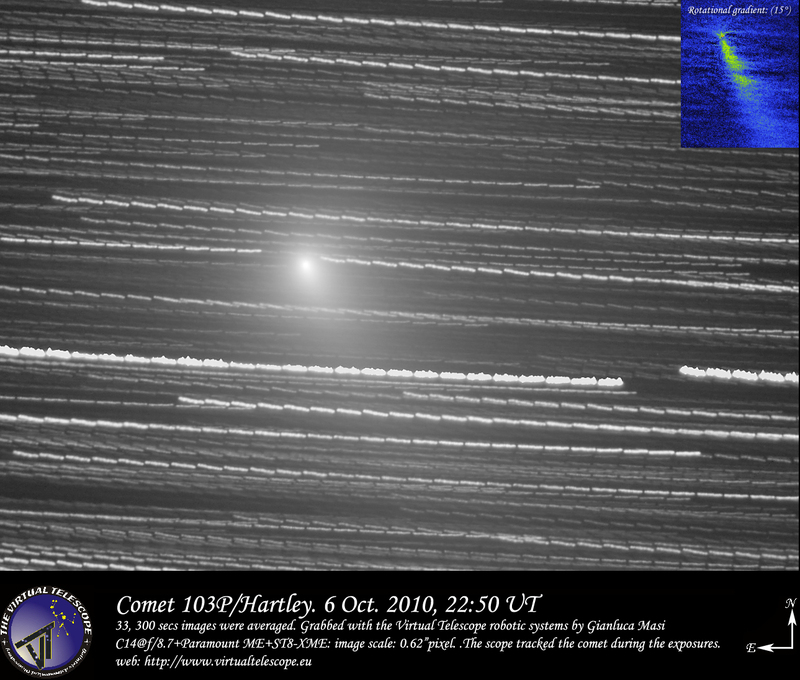 • There's also the new comet P/2010 T1 (McNaught). 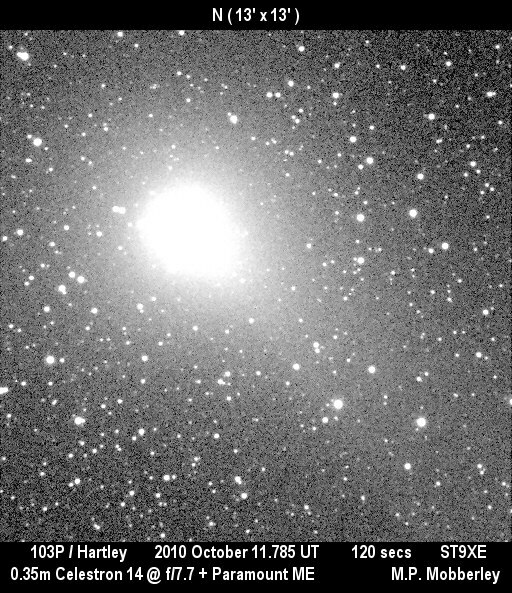 In other small body news a prediction for a Draconids outburst in 2011 (also covered here and hier), though rather uncertain and drenched in moonlight anyway. • Reports of fireballs in New Mexico (more) and Germany. • A paper, press trelease and story about activity in Geminids-parent Phaethon which may be a "rock comet". 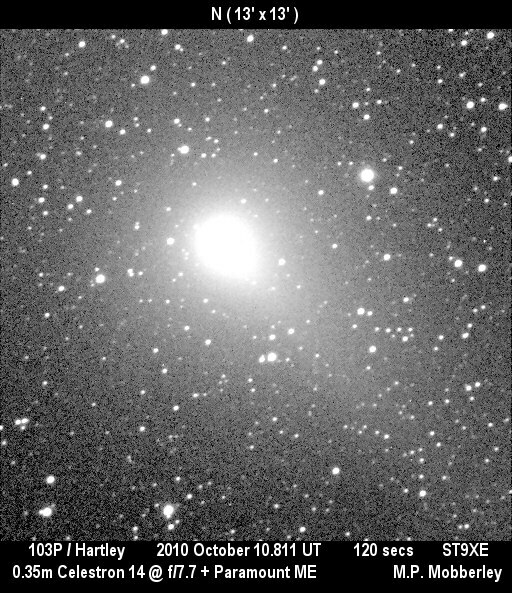 • A paper and another one (also here), numerous press releases such as here, here, here, here, here, here, here, here and here and articles like this, this, this, this, dieser and more argue for an asteroid collision as the cause of P/2010 A2's tail. As I comment here the Spanish faction stands by its alternate explanation reported here earlier. • More about the Kamil crater discovery. It's now 20 years since the 1st automatic NEO discovery with Spacewatch, and the technology is pretty mature now - e.g. 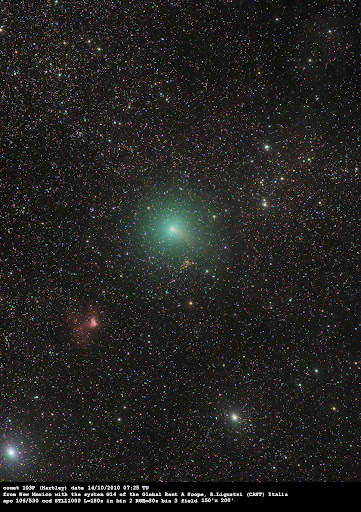 at the La Sagra Sky Survey run entirely by amateurs which just bagged another comet. 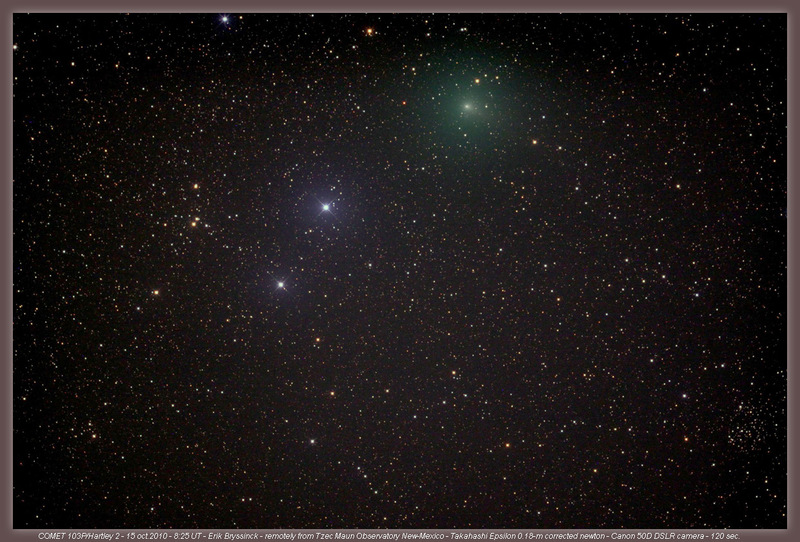 And somewhat controversial PanSTARRS has also found its first PHA (more, mehr). 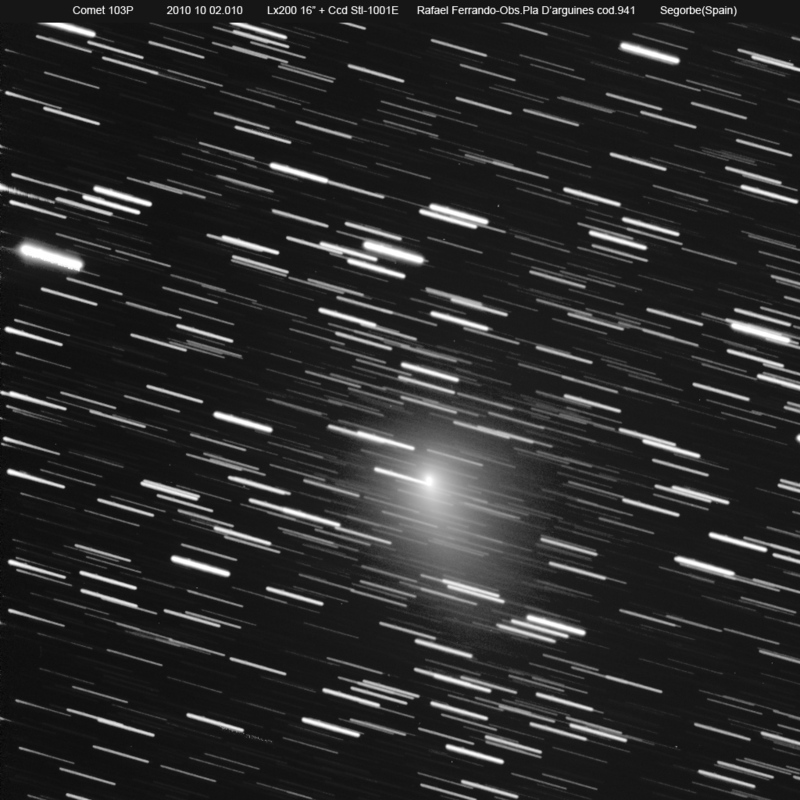 • Meanwhile another space rock of 5-10 meters has whizzed by Earth, 2010 TD54: video clips (also here; earlier), a demonstration how it came closer, a light curve unveiling rapid rotation and more video. • A video of a star occultation by Isis on Sep. 20 - and it's been 30 years since a major event with Kleopatra. In other solar system news some great images from Pic du Midi with striking resolution. • More on Jupiter's record-close opposition - with Uranus nearby - here, here and here, plus a collage showing both in motion, questions and one success re. naked-eye visibility of the Galilean moons, some Jupiter images, also of Sep. 29, Sep. 22 (IR rotation movie, als a visible panel) and Sep. 13 plus more. Also the role of amateurs in monitoring Jupiter and the Harvest Moon nearby which looked like this (and later like this and this). • Mars 2010 rotating. • The ISS in transit of Venus (also shown here), Venus as a crescent and the ISS transiting a sunspot and the H-Alpha Sun. • Elsewhere some news from Eps Aur. • And regarding what's up in October, other than Hartley 2 and Jupiter with Uranus little from the solar system can be seen easily, as previews here, hier, hier, hier and hier show - the Orionids are lost in moonlight.